A standalone thriller featuring a “tough-talking, scarred heroine” (Publishers Weekly) from the author of the Temperance Brennan series, the basis for the hit TV show Bones. Like Temperance Brennan before her, Sunday Night is an extraordinary and wonderfully unconventional new crime heroine. Ex-military, ex-police, Sunday lives in survivalist isolation with a squirrel for company. Her crime solving skills are stronger than her social skills and even as we meet her adoptive father and her twin brother, Sunday’s early years experiences are only revealed in flashbacks and reflections – and we are never too sure whether we are learning more about Sunday or about the victim she is tracking. At the start of this story, Sunday is hired by a wealthy Southern matriarch to find her missing granddaughter. As Sunday pursues the group who abducted Stella, she traverses the United States, eliminating individual members of the hate group who killed Stella’s family as her investigation progresses. The action in this story is fast and the complicated threads of this story are carefully woven. The result is an exciting read that allows readers to make guesses and predictions alongside Sunday but never to fully guess the ending. This is a violent story and Sunday is often a violent character. She isn’t constrained by military or police regulations and something about Stella’s disappearance affects Sunday in ways she can’t explain. We often see cowboy vigilante male leads in crime fiction and I love Sunday’s cold pragmatism – she doesn’t waste any time angsting over dead terrorists. Female protagonists like Sunday Night are often reserved for Urban Fantasy writing where female writers create alternate realities with strong and unapologetic women. This time, Sunday Night exists in a chillingly real contemporary America and the feminist inside me was doing a happy dance from start to end of this story. I love Sunday and I’m already waiting desperately for the rest of the series and the TV spinoff… This is such a great story and I recommend it highly to crime fiction fans everywhere. I wanted to like this book more than I did. The two stories in one was confusing and the resolution of the story within the story did throw an unexpected twist in the story. Sunday Night is a retired cop and former soldier who was put out to pasture for her quick temper and because she killed a suspect in the incident that almost left her blind in one eye. Her murky past plays a major role in how she is the way she is, and that only adds to her desire to be left alone. When her foster father brings her the tale of a family killed in a terrorist attack a year ago and the grandmother's belief that her granddaughter may be alive, Sunday doesn't want any part of it at first. Reluctantly agreeing to investigate the case, Sunnie travels to Chicago on the trail of a killer or killers. A lot happens in the course of the book which seems to take place in the span of less than a week. We are treated to insights to Sunnie's past, her few relationships, and her determination to bring a girl home to her family while dealing with her past trying to choke her from within. This was a hard book to really dig into. I thought that it had a great premise, but the delivery fell short for me. Sunday is looking for something – what? Well, I never really guessed what she was looking for. When she's sent on a mission to bring home a young girl, we're to follow along among Sunday's story and the one of the young girl. While I did enjoy the back and forth of the story – trying to figure out the plot of the attacks – it was very hard to follow as it was less than coherent at times. This story takes you from East to West coasts in a matter of days and even though it doesn't really feel rushed, it is. In the end, I guess I was just left with questions. I liked how the story resolved, but felt that something was missing. Our heroine, Sunday Night, keeps people at arm’s length and as I read it, I felt as though I was being kept there with them. There are two mysteries in this story, the primary being Sunday's investigation into the disappearance of Stella after a bombing at a Jewish school, which I quite enjoyed. The secondary story is shown as flashbacks to Sunday's childhood where she is in a cult. I found this a little frustrating because we only get snippets of that story and it seemed deliberately vague. The author did an excellent job portraying the tedium involved in being an investigator because there were times I found the story overly descriptive. There is a good amount of suspense and the buildup and climax were well done. I was excited to read my first Kathy Reichs’ novel but I'm not sure it lived up to my expectations. Two Nights is a good story and I did enjoy it, just not as much as I'd hoped. 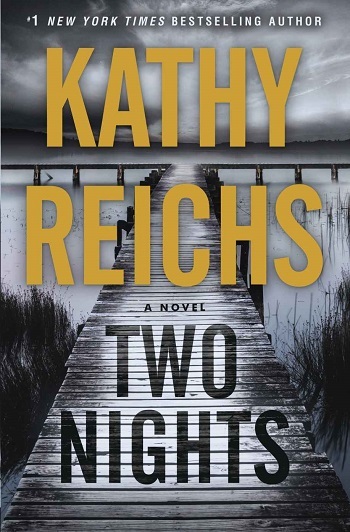 Reviewers on the Wicked Reads Review Team were provided a free copy of Two Nights by Kathy Reichs to read and review.